The screenshots are the process I went thru and at the bottom is a quick review. This is a good thing to do to protect your files in the event of problems with your computer or whatever device you are using (can also protect your iPhone and Android data if want to), I previously used a USB stick but think this is better because a USB stick can be lost or stolen. This is very wise to do especially if you use your computer to make money online via self-employment. Let’s get started then, all instructions done here were using a desktop PC, the process may be different on other devices. 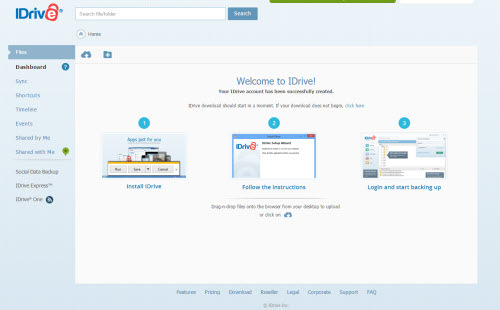 First visit the IDrive Online Backup website and click on the ‘Sign up’ link in the top right corner of the screen. You need to sign-up for a free account, according to the sign-up form I have the best name ever…just saying. Then pick whether you want to set your own encryption key that only you know, it will not be stored on IDrive’s servers. Once you’ve chosen you will then be welcomed in to your new account and the setup software will begin downloading. Follow the instructions to complete the installation process. It’s simple and only takes a couple of minutes. Once installed this is how it should look, go ahead and login using the form. 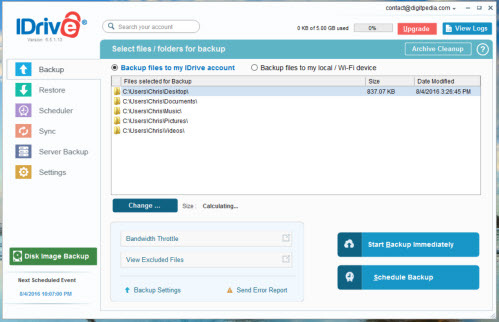 Once logged in it will find your folders on your desktop and you can choose what to backup. With the free account you get a limit of 5GB, if you need any more than that you will have to upgrade. 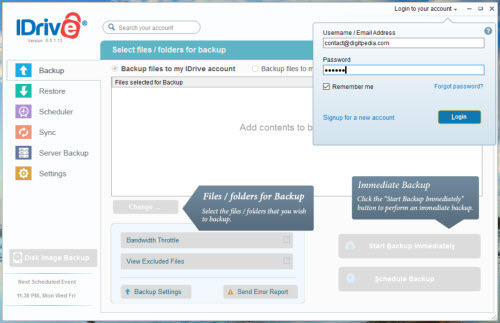 Click on the large blue ‘Start backup immediately’ button and away it goes. As it goes thru your files you can see how long has elapsed, and how much more time it expects to take to get thru all of the files you wish to backup. How long it will take will obviously depend on how large your files are, but expect it to take a while, if you don’t want it slowing your machine down then you can schedule it, or simply do it manually when you’ve finished with your computer and are happy to leave it backing up what you want it to. Alternatively you can also do it via the menu when you right-click, as shown in this screenshot. 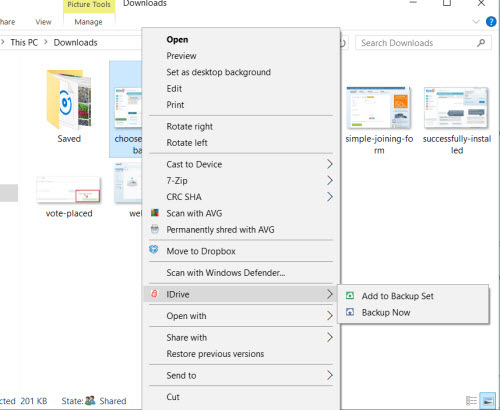 I haven’t fully tested all of the services on offer, but if you want to use them IDrive also have the option to backup Facebook and Instagram if you so feel the need to. You can find that by the links on the left once you’re logged in, as you can see here. 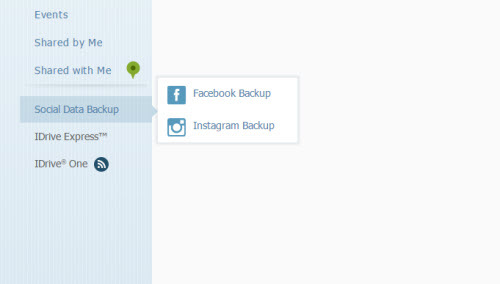 Instagram and facebook backups are possible. All in all I found the service very smooth to use, and at no cost it’s excellent. In PC Mag they rated this software 4/5, I would also give it a positive review and say 4.5/5, an extra half a point I think is fair! 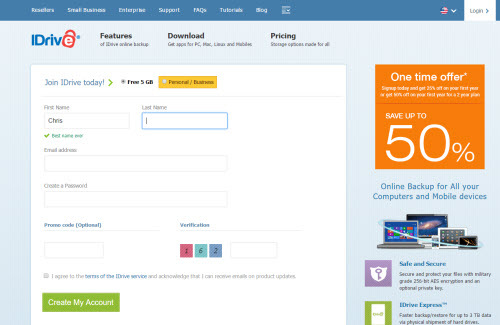 I would recommend the website if you need a solution like this to backup your files securely.